This fairly straight-forward CoverGirl LashBlast ad — seen in this week's Ok! 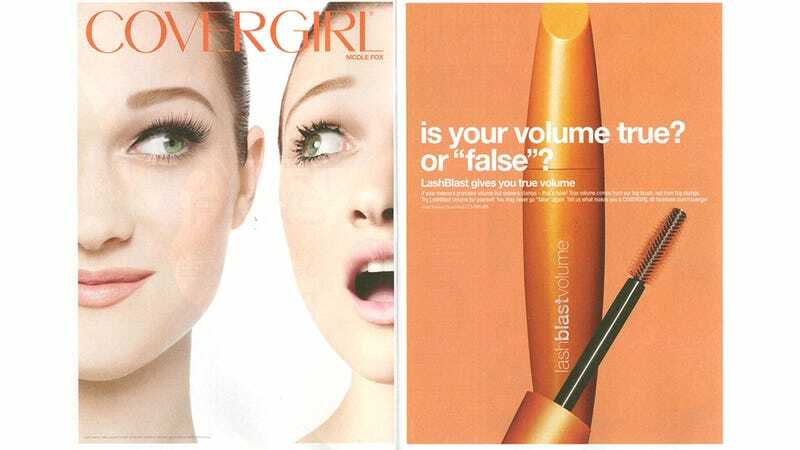 magazine — features two images of ANTM winner Nicole Fox, and one beauty shot of a mascara bottle and wand. The copy asks, "Is your volume true? Or false?" And continues: "LastBlast gives you true volume. If your mascara promises volume but delivers clumps — that's false! True volume comes from our big brush, not from big clumps. Try LastBlast Volume for yourself. You may never go 'false' again." Lash inserts were applied to both of Nicole's lashes to add lash count before applying mascara. In other words: She is wearing false lashes. Individual false lash inserts, to "add to lash count." To make her lashes seem more voluminous. To advertise a mascara that adds volume. But it's not "false advertising," because CoverGirl admits that there are inserts. In the tiniest, most whispery font ever. Pretty sneaky, sis!